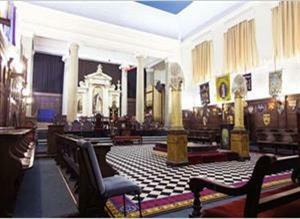 A tour of The Masonic Hall in Bath, also know as the Old Theatre Royal. During your fascinating one-hour Guided Tour, you will stand on the very stage where Sarah Siddons, the finest Tragic Actress of all time, received the adulation of her audiences. Go backstage to see the original 18th Century Scenery Loft. You will visit the chapel where Bishop Baines would prepare before delivering his fiery sermons. Enter the vaults below where exiled French nobility were once buried. Finally, you will experience the ambience of one of the grandest Masonic Halls in the country, and view possibly one of the finest collections of rare Masonic Artefacts in the World.